Having worked for years in manufacturing businesses, I find there are many things in common with other types of organizations including colleges and universities. For example, the production activity in manufacturing is defined by upstream design work performed by engineers. Their product is a blueprint, which tells production management and production workers what to make, while sales informs them of how much to make and when to make it. In higher ed, professors have long acted as both designer of the course and the one who produces (delivers) the course. The defining document for the course is the syllabus. Prior to the establishment of a course, a form is usually filled out that proposes a course for consideration and acceptance by faculty in the department, the school, and the curriculum committee. Section 1 – Type of course, the student’s learning challenge, the aid(s) used to facilitate learning, delivery mode, pedagogy, and maximum number of students for effective learning. The learning aid, in this case a problem-solving template, which links to the learning challenges and Section 8, Bloom’s Taxonomy. It is my view that learning aids (templates for problem-solving) could be more widely used to great effect for achieving student learning objectives. Section 2 – Learning objectives are few in number and focused on what the course truly seeks to accomplish. There should be alignment between the Learning Challenge and Learning Aid (Section 1) and Bloom’s Taxonomy (Section 8). Section 3 – Requires the professor to think about the amount of theory and real-world practice contained in the course and justify the balance. Courses weak in practice should be strengthened in that area while those strong in practice might introduce some appropriate amount of theory. Section 4 – This section identifies the type and number of assignments, assignment evaluation schedule, estimated time to complete assignments, in-class evaluations, and exams. This captures both the student and faculty workload for the course. It helps differentiate between 3-credit courses that require a lot of work by the teacher and those that require less work, thereby enabling supervision to better manage faculty load (assuming the words “student success” are more than rhetoric). Section 5 – Identifies qualified teachers. The fact that there is only one qualified instructor to teach the course identifies a potential problem. This would be more of a problem for a required course in the degree program than for an elective course. Section 6 – Identifies classes that are critical for students to attend to assure student success. This is especially important for part-time working professional students whose schedule is uncertain and may miss some classes due to work and family commitments. Students would benefit from knowing this prior to the start of the class. 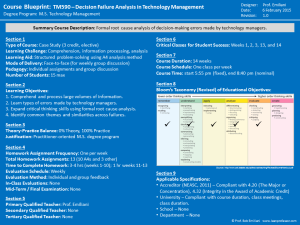 Section 7 – Course schedule and duration, and emphasis on the need to start each class on-time, while end-time varies according to the extent of useful discussion. Section 8 – Relationship to Bloom’s Taxonomy. Requires professor to identify (check marks) which elements of Bloom’s Taxonomy are part of the educational objective of the course. This should link to Section 1, Learning Aid, to create learning aids that strengthen the Learning Challenge in relation to Bloom’s Taxonomy. Section 9 – Identify specifications that pertain to the course: Accreditor, University, School, and Department. The lack of specifications point to potential problems. My University has no documented (simple) specification for lecture courses, online courses, hybrid courses, or laboratory courses. Their design is guided by tradition or opinion, which means there will be many problems as perceived by students due to a large amount of variation. Likewise, my school (of Engineering, Science, and Technology) has no specification for lecture courses, online courses, and so on, nor does my department. Professionally run organizations carefully define the goods and services they produce and also assure the goods and services conform to blueprints and specifications. In industry, that requirement is fulfilled by workers, managers, and auditors, through self-inspection, monitoring of performance metrics, and physical inspection. The blueprint proposed here allows for inspection, auditing, and the creation of simple metrics and data collection that, in my view, form the basis for more meaningful and accurate assessment and reporting. A blueprint similar to that shown above could also be created for an academic program and would likewise prove to be beneficial.